Snapchat is currently a popular photo-sharing app. You send photos to someone and the photo gets automatically deleted after a few moments. Neither you nor the recipient can then recover the image once it self-destructs automatically. However, if you believe that delete Snapchat photos is finished, you are wrong. Part 1: Why You Should Delete Snapchat Pictures? Even through they claimed that Snapchat images self-destructs automatically. However, the images are not really deleted from the sender’s device. A forensics firm has confirmed that the pictures one sends on Snapchat are stored in the sender’s device and can be easily extracted as well. This makes it very important for you to delete your private pictures before someone gets to them. Part 2: How to Delete Snapchat Pictures on iPhone? Step 1: Open the Snapchat app and tap on the ghost Snapchat ghost at the top center. Step 2: Tap on the gear icon with your name and score at the top left to get into the settings. Step 3: Scroll down to Account Actions and tap on “Clear Conversations” in that menu. If you use Snapchat on iPhone, the app provides you with an option to save the Snapshots in your phone. To completely get rid of Snapchat and its pictures, simply unload the app if you don’t want to use it anymore. Press Snapchat app icon and hold it until "X" shows up at the left and click "X" to delete Snapchat. 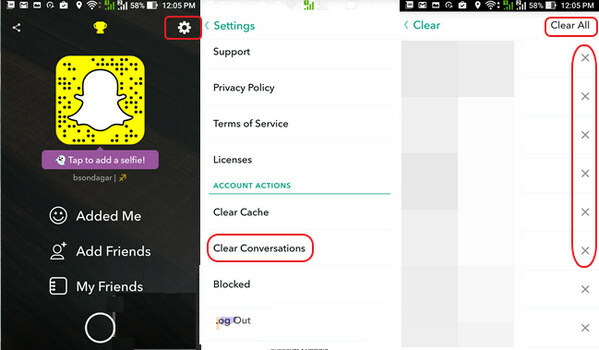 Part 3: How to Clear Snapchat Data? If you are looking for a simpler way to delete everything related to Snapchat in your iPhone, like the crash logs, caches, corrupted files, etc, iMyFone Umate Pro or iMyFone Umate Pro for Mac is an excellent choice. The ‘1-Click Free Up Space’ features of this software will help you delete everything related to Snapchat in an instant. Delete junk files for Free. Delete temp files for Snapchat. Permanently erase fragments from Snapchat. 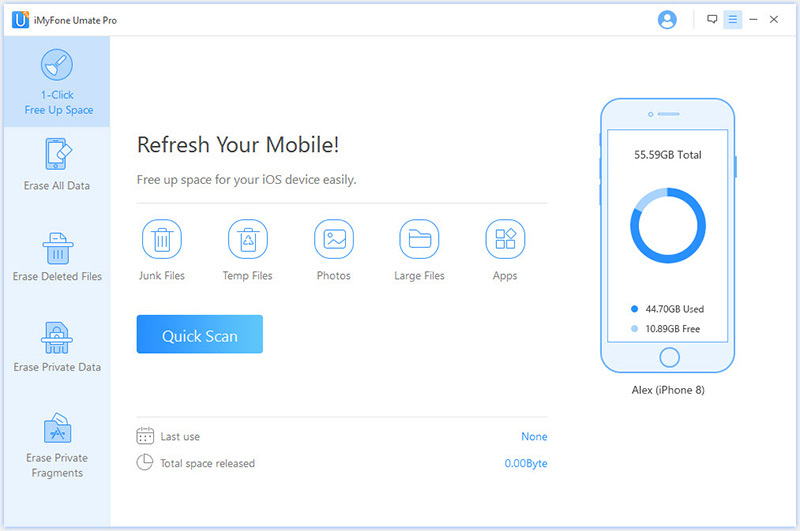 Step 1: After downloading the software, launch it and connect your iPhone to iMyFone Umate Pro. Step 2: Now, click "Quick Scan" on ‘1-Click to Free Up Space’ mode to start scanning the device. Step 3: Once the scanning is done, you’ll get to see all the data which can be deleted from your iPhone. Step 4: Simply select the junk or temp files that you want to delete and click "Clean". For junk files, you can clean Snapchat related crash logs, photos caches, user storage files, etc. For temp files, just tap "Clean". 2. How to Permanently Delete All Snapchat Data? 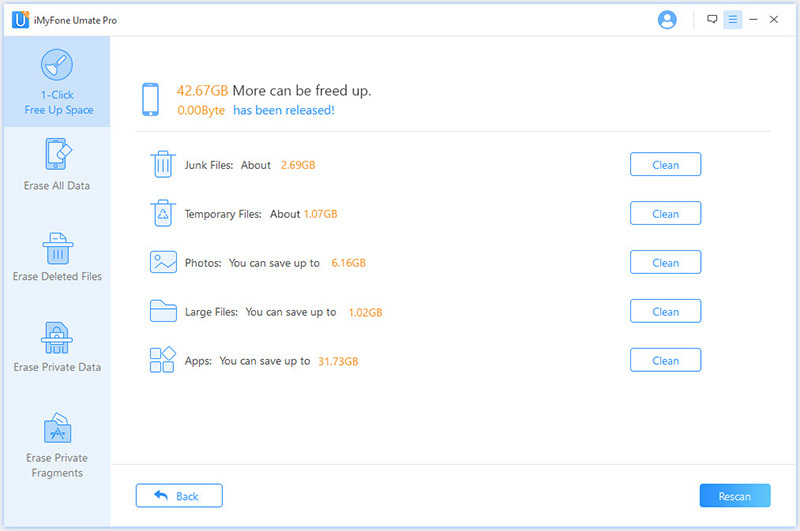 If you are worried about the Snapshots which are still available on your iPhone, iMyFone Umate Pro can be an excellent solution for that as well. The software comes with a number of features, including "Erase Private Fragments" mode, which can help to delete Snapchat data permanently from the iPhone and can never be recovered with the help of any tool or software.